E3 is a small memory foam mattress company with a big factory behind it (they’ve been making mattress components for many years). E3 is sold online only, cutting out the middle man, and I think because of this and their close ties to their manufacturing they’ve created a product that has very good value compared to other memory foam mattresses on the market. It has a standard memory foam feel, and though it’s definitely not for everyone, I think some customers should really consider this up-and-coming brand. (See also our guide on finding the best memory foam mattress). Who will love the E3 Mattress? You want a mattress that provides a lot of value – the founder’s family manufactures mattress components (for other brands) and they sell only online, cutting out as many middle men as possible, and passing some of that savings on to the customer. 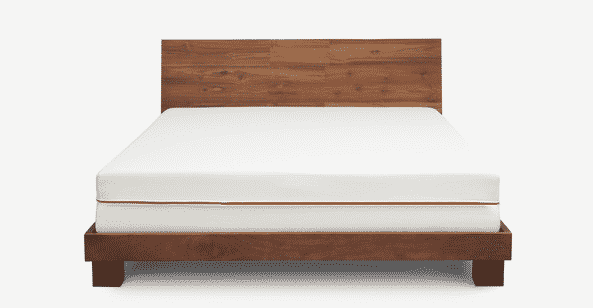 You have pretty average sleep preferences – the people behind E3 have been manufacturing mattresses for a long time, so they know better than almost anyone what people want in general. Your mattress can’t sleep hot – some memory foam mattresses feel hot during the night, I had no issues with E3. You are heavyset – not exclusively for heavy people, but I found that the mattress is especially supportive for a memory foam mattress. You don’t mind/prefer buying online – click a button and it’s there, avoid the mattress store rat race with this one. You’re not sure about memory foam – this is a good mattress at a good price, but if you don’t like the feel of memory foam, it’s not going to magically change your mind. You want all the bells and whistles – this mattress is not Tempurpedic, but for the price is a great option. If you want more foam, more cooling technology, etc, then there are other mattresses that are a better fit. You want to test the mattress out beforehand – not an option, this is online only. They do give you 30 days to test it out at home with a guaranteed full refund if you’re worried. You want to hear about other peoples’ experiences – this is a small brand with only a few reviews, so you won’t be able to find thousands of reviews like the major mattress brands. You want options – E3 only comes in one model (geared more towards an average sleeper) so if you want extra soft or extra firm, you’re out of luck. Usually I try out a mattress for two weeks, but I ended up being on the E3 for ~3 weeks due to some life/travel events. I think that the messaging rings true on this one – it’s definitely a nice mattress, not up to a true luxury standard (biggest comparison with memory foam will always be Tempur-Pedic), but more than good enough for someone looking for a good night’s sleep. It didn’t sleep hot for me at all, and was definitely very comfortable. It was actually slightly less firm than I expected, but only by a little bit. I still felt really supported, and it actually felt to me a little more plush than the average memory foam mattress. The only real complaint is that the edge support isn’t great – which doesn’t really matter too much, but I did notice when putting shoes on in the morning. Not many memory foam mattresses are very good at this aspect anyway. Overall it was a great 3 weeks – very comfortable and predictable each night. But it’s not Tempurpedic! Isn’t that the best? There are a number of new mattress companies selling online that are new and have little brand recognition. Downside? They certainly aren’t as well known as the big guys. Upside? If you take the risk and like it you’re getting a mattress that would probably be sold a lot more in retail stores. E3 at the time of this review is new and still trying to establish its reputation in the market, so if you do go with them, make sure to really take advantage of their 30 day trial period and make sure you like the mattress. I tend to give the online companies the benefit of the doubt because of this return period – the risk is really theirs, not yours. Do I recommend the E3 mattress? I had a good experience with the mattress, and I think it could be a good choice for people looking for a solid memory foam mattress. Even though it’s a newer company, I think the founder’s ties to the factory means that it has some credibility in terms of durability and craftsmanship. If you want a well-known established brand, E3 isn’t the one for you, but if their mattress and message intrigues you, I think they are definitely worth giving a try.